Sea Breeze offers central, seafront bed and breakfast accommodation with views over the beautiful Dovey estuary and the mountains beyond. 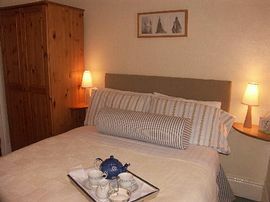 Ideally situated in the old fishing port of Aberdovey in Wales at the edge of the Snowdonia National Park. 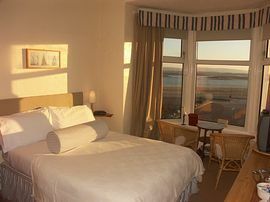 All rooms are en-suite and five have uninterrupted sea views over the estuary, sandy beaches and the mountains beyond. 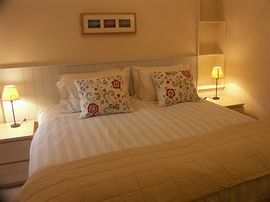 Our eight rooms are tastefully decorated, offering a hospitality tray, colour television with DVD and hairdryer. The en-suite shower rooms are newly refurbished and offer a large 1.2 metre shower tray with power shower and complimentary toiletries. You'll find fresh flowers and individual touches throughout Sea Breeze. 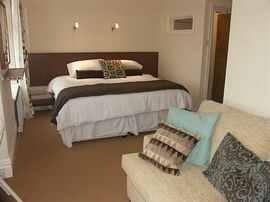 Our rates include a choice of breakfasts and complimentary car parking passes. A warm and friendly welcome awaits you from your hosts - Lisa and Julian Price, who will help you make the most of your stay in Aberdovey on the Cardigan Bay coastline in Wales. The experience they have both gained by travelling & working in hotels of the highest quality, has now been brought to Sea Breeze. prpn = per room per night including a choice of breakfasts. Sea Breeze is non-smoking throughout. 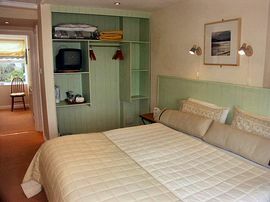 We welcome well behaved children in their own rooms at the rates quoted above. Check in time is from 2.30pm (unless by prior arrangement). Check out time is 10.00am. We will store any luggage for you. A Deposit equivalent to 1 nights' stay or 40% of the total booking (whichever is greatest) is required to guarantee your booking. Group bookings must pay the deposit in full for the duration of their stay at the time of booking. Cancellation Policy is 2 weeks before arrival. After this date deposits cannot be refunded. If cancelled within 5 days of arrival the whole amount for the duration of your stay will be charged. Let us know if you require a copy of our access statement. for only £85.00 per person. Special Diets Provision: Special diets are catered for. Seabreeze offers a varied selection for breakfast catering for vegetarians, gluten free diets or those looking for a healthy option. You will find Seabreeze located on the sea front, opposite the beach car park.